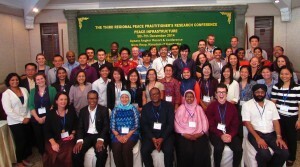 The third annual Peace Practitioner’s Research Conference (PPRC) was held December 5 – 7, 2014 in Siem Reap, Cambodia. Featuring a key note address by Executive Director of the West Africa Network for Peacebuilding (WANEP) Emmanuel Bombande, the conference’s theme was ‘peace infrastructures’, focusing on the importance of institutional structures that can foster cooperation between stakeholders to prevent conflict and promote and maintain peace. While immense amounts of resources are poured into war infrastructure, including military and defence strategies, much less effort is put into mechanisms that promote dialogue and cooperation to prevent or resolve conflict. The conference objectives were therefore to better contextualise the topic of peace infrastructures and how they can be established and supported within the various contexts of those in attendance. The conference was attended by 68 people from 14 countries, representing civil society organisations, universities and research institutes, political organisations, and governmental agencies. 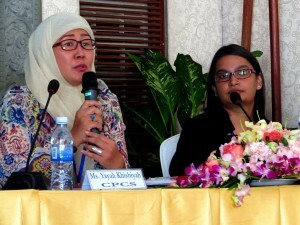 Thirty-two abstracts were received and 10 were selected for presentations. Discussions were stimulated by the diversity of activities over the three days, including lecture style presentations, panel discussions, reflection activities, short chats and group breakout sessions, which created an environment of high energy, active and open discussion, sharing of personal experiences and opinions, and bonding between participants. The conference concluded with group discussions pulling together all of the lessons learned over the course of the conference and strategies for implementing these lessons in other contexts, leaving participants with a powerful and functional take-away message to bring back to their home environments.